Paul, well said and Flanagan lives in Melbourne Victoria, not Tasmania and is a novelist, not a scientist. He has been widely pilloried for his essay which effectively trivialises those other terrible bushfires of the past such as 1967. 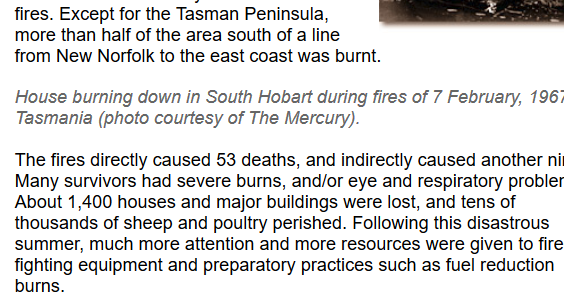 I can remember 1967 and other fires in the 1970s and 1980s that burnt towns such as Zeehan in 1981 almost to the ground with fireballs rolling down the main street. Flanagan is simply a commentator and because of his ‘celebrity’ status gets a hearing, particularly from the left MSM. Wild fires in North America are down 80% from the 1930s. 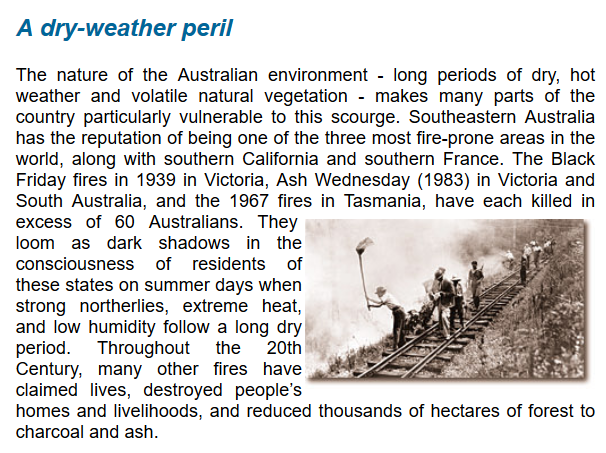 “Widespread bushfires occurred in Victoria in early February 1851. 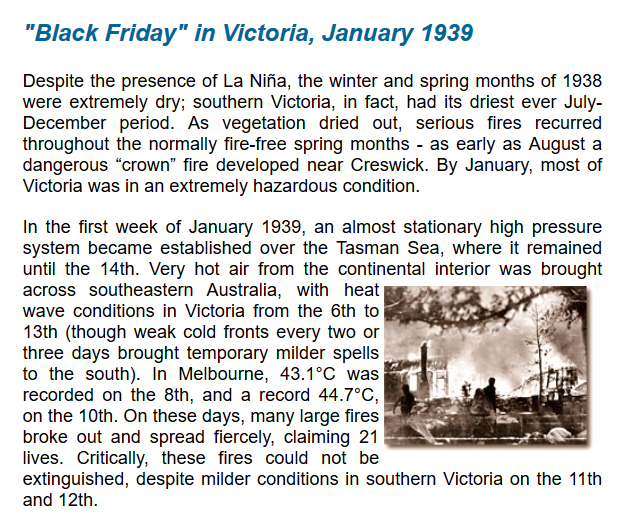 The height of the destruction happened on Black Thursday, 6 February 1851. 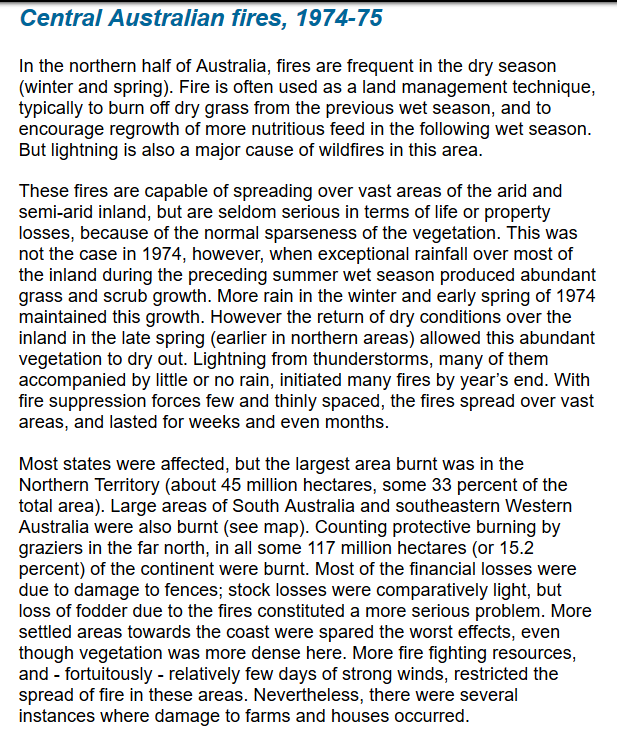 Paul – I respectively suggest that the headline should be, “no, wildfires are not caused by ‘man-made’ climate change. We should keep the ‘man-made’ in the conversation, as AGW and ACC are proposed to be a worsening of GW and CC – not the whole package. We’re debating whether or not there is an observable human footprint in GT’s and if so, how much is it, and if so, how might that affect Earth’s climate, if it does at all. They are leading most layman [voters] to believe that all climate change is now caused by man. Just had dinner with two of them the other evening. 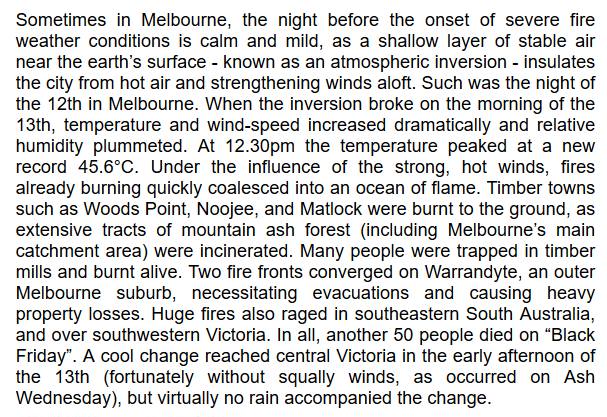 They – teachers – had no concept of the possibility that all climate change – all extreme weather – was not now man-made. And why not? That’s all that they hear – even from the skeptical side. The Guardian has lot the plot climate-wise, but not before corrupting the minds of many of its readers. That’s assuming readers of the Guardian have minds to corrupt. On the bright side, they are few in number and mostly work for the BBC and local government. Meanwhile, the Climate Coalition outfit is ramping up the hype and hysteria. School children are being brainwashed to such an extent that there is a general move on to get them to come out “on strike” to encourage the government to do more to “combat climate change”. Marxism is alive and well when children are being used to spread propaganda. If the whole Climate Change ‘thing’ eventually becomes absolutely clearly and undeniably wrong, then we will have a generation of children who will have no trust in science. It is hard to over estimate the seriousness of that. Peer review used to be a mechanism that stopped clearly inaccurate papers getting published. It was always rather corrupt, but it did used to achieve that. Now it means nothing. A search using the statement . . .
. . . will show that some young people are not fond of being lied to and bullied. When young people realize teachers and the media have been bullying them, they won’t like that either. A spokesman from the IPPR was interviewed on TODAY this morning about the challenge that AGW presents the world (he quoted all the scare stories about more frequent fires, storms, heat-waves, etc). The solution, he put forward was that ‘we’ need the ‘World’ to come together to form a more [socialist] government. (all the words were there that described such a socialist solution, he just didn’t use the actual word). The interviewer failed miserably to challenge on any point the IPPR put fwd but as this was the BBC, that’s par for the course. I find the new watermark advertising is a pain when I view the right on a tablet. It can make articles and charts unreadable. Australia, like California and the Mediterranean countries, has the vegetation type known as Mediterranean Sclerophyll or Chaparral. It consists of woody shrubs with leathery leaves which have a lot of resins in them. Such leaves are less prone to desiccation and predation by insects and herbivores. These species out compete other species in such normally dry areas. Also they are fire prone due to the resins, but again this is to their advantage. They can survive the frequent flash fires which are a part of these ecosystems. 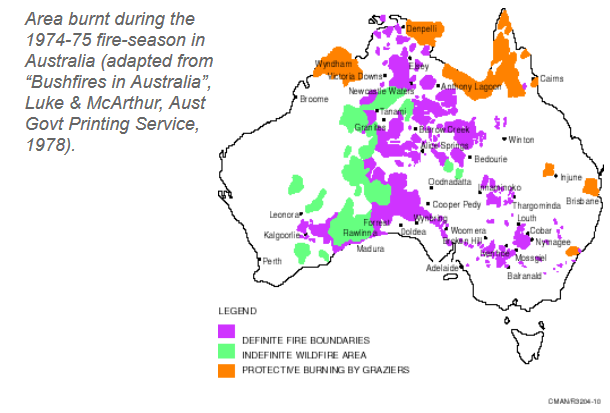 Where there is a large build-up of fuel on the ground when man prevents these natural fires, they become destructive. For warmists history starts about 10 years ago, they totally ignore anything before that as it does not fit their World View. 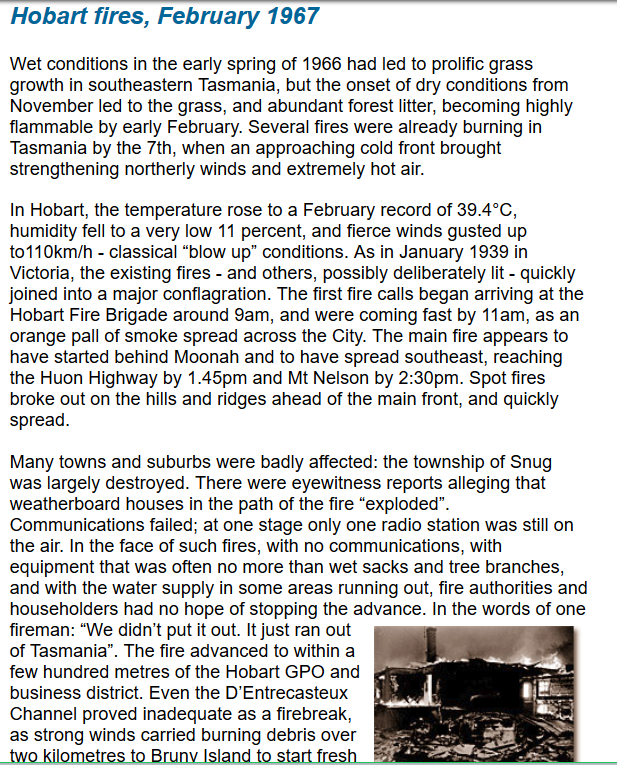 Flanagan’s point I believe is more that Tasmania, the green and pleasant isle with a mild climate, is burning. This very competent document is available online as an eprint from Utas and provides a complete rebuttal to Flanagan’s wilder claims that this is all unusual, and to his depressingly familiar rhetoric.